I hope you've all had the most wonderful Christmas! I don't quite know how to describe ours... Last week we welcomed the sweetest new niece into the world; this week we are mourning Ez's beloved Pop, the original Ez, who passed away on Monday after a few months of declining health. Pop was a happy-go-lucky sort of guy, and one thing I'll never forget is how he greeted everyone he loved with a kiss right on the mouth. (That took some getting used to, and only Pop could get away with it.) Planning a memorial service between Christmas parties and presents is a bit disorienting. This morning I was arranging a collage of photos for Pop's memorial service, and then a few minutes later I was cooing over my 10-day-old niece. I am reminded that without death, there'd be no room for new babies. Thank you, Jesus. I am loving -- LOVING -- how the kitchen stairs and pantry are turning out... My dad and Ez spent many hours figuring out how to make it all work before a single board was even cut, and I think Ez basically became a master carpenter as a result of this single corner of the house. I'm so proud of him and the amazing job he did. 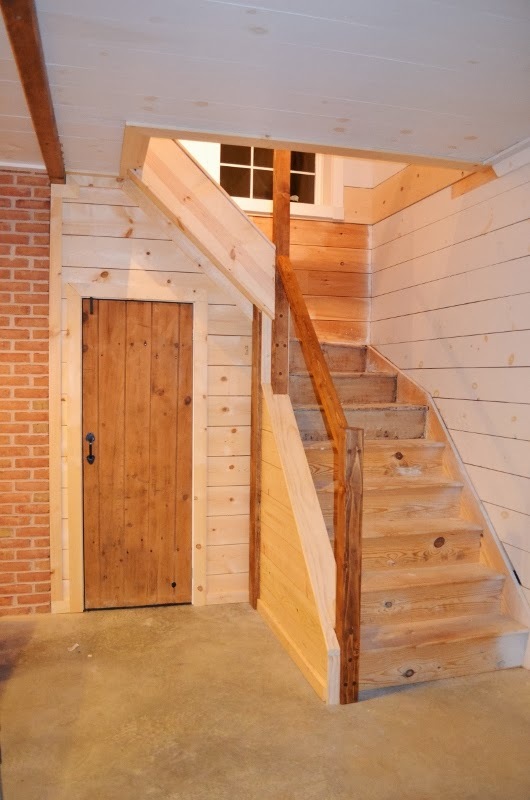 And that door (along with most of the stairs) is original to the house, which makes me happy. Staining the newel posts and handrails was my Christmas Day project. Aside from gutters and brick outside (and I'm not sure when those will happen yet since we're hiring someone to do those), we mainly have small, easily manageable things left to do before the appraisal: Installing trim. Cleaning. Painting. Installing balusters for the stair railing. Installing bathroom sinks. All things we can handle. Again, thank you, Jesus. In the meantime, Johnnie is stirring from her nap, and it's almost time to leave for Pop's viewing. And then there will be a dear little baby who will need her auntie to hold her for a little while... The house will get done, but not today. That looks real nice! I see all of those angles in the stairs. Is this where you'll be staining the steps or painting? I am very sorry to hear about "S's" father. Thank you. It was his grandfather, though he and Ez were so close he was more like a second father sometimes. We plan to stain the stairs, and probably paint the outer edges white to make a stained "runner," like in the post I wrote a few months back. We'll see how the stain looks and go from there. This looks gorgeous. What a beautiful space. Thanks! It's looking better and better, and it's becoming my favorite corner! Gutters come in far more types than you can imagine. Aluminium gutters, copper gutters, plastic gutters are some of them. It's construction is a very typical task. A correctly installed gutter system will increase the efficiency of water transfer from roof to drainage system. Aluminium gutters are the best as the metal is corrosion-resistant, lightweight, easy to work with, available in wide range of colors, and less expensive than the other alternatives. I am really sorry that Ez lost his grandfather.......I know what it means to lose a beloved grandparent. They do live within you in heart and mind. You have really accomplished so much in the past weeks!